Werner's Cairns blog: Paw Paw / Papaya an enormously healthy fruit. generally refer to them in Australia, for a long time. I’m lucky to be able to have them growing in my yard and available all year round. Although Paw Paws and Papayas are the same, there is sometimes a distinction made between the two. They are: Paw Paw (yellow flesh) and Papaya (red or orange flesh). The fruit is an excellent source of vitamin A and C, a good source of dietary fibre, potassium and contains some vitamin B1. I have known for some time that Paw Paw/Papaya fruit is a rich source of valuable proteolytic enzymes, such as papain, and a few others, which can greatly aid in the digestive process. I have read many times and been told by health professionals that “Good Health Begins with Good Digestion”. Raw papaya is excellent as a meat tenderiser. Due to its digestive enzyme (in the raw fruit), it breaks down the meat and tenderises it. The seeds may be dried in a dehydrator then ground in a mortar and pestle and used like pepper. Following is an interesting article that was sent to me and I want to share it. Please note! I published this as a matter of interest and not as medical advice. However, what I would advise you is to eat this fruit daily if they are available in your area. Also, here are some interesting links you should have a look at. 1. 12 reasons you should eat papaya. Click here. 2. Health benefit of papaya. Click here. 3. How Papaya Enzyme Benefits Digestion. Click here. The interesting Fruit Papaya....Papaya was the only studied food found to halt breast cancer. Scientists studied 14 plant foods commonly consumed in Mexico to determine their ability to halt breast cancer cell growth. These included avocado, black sapodilla, guava, mango, prickly pear cactus (nopal), pineapple, grapes, tomato, and papaya. They also evaluated beta-carotene, total plant phenolics, and gallic acid contents and antioxidant capacity. They found that only papaya had a significant effect on stopping breast cancer cell growth. Papaya is a store-house of cancer-fighting lycopene. The intense orangey-pink colour of papaya means it is chock full of cancer fighting carotenoids. Not only beta carotene, but lycopene is found in abundance. The construction of lycopene makes it highly reactive towards oxygen and free radicals. Scientists at the University of Illinois think this anti-oxidant activity contributes to its effectiveness as a cancer fighting agent. Epidemiological studies have indicated an inverse relationship between lycopene intake and prostate cancer risk. They showed that oral lycopene is highly bio available, accumulates in prostate tissue, and is localised in the nucleus of prostate epithelial cells. In addition to antioxidant activity, other experiments have indicated that lycopene induces cancer cell death, anti-metastatic activity, and the up-regulation of protective enzymes. (The experiment report on cancer cells, Phase I and II studies have established the safety of lycopene supplementation was done on October 8, 2008). Prostate cancer was the subject of a study in Australia that looked at 130 prostate cancer patients and 274 hospitalized controls. The scientists found that men who consumed the most lycopene-rich fruits and vegetables such as papaya were 82% less likely to have prostate cancer. In this study, green tea also exerted a powerful anti-cancer effect. When lycopene-rich foods were consumed with green tea, the combination was even more effective, an outcome the researchers credited to their synergy. ( Asia Pacific Journal of Clinical Nutrition, 2007). Isothiocyanates found in papaya restore the cell cycle to eliminate cancer. 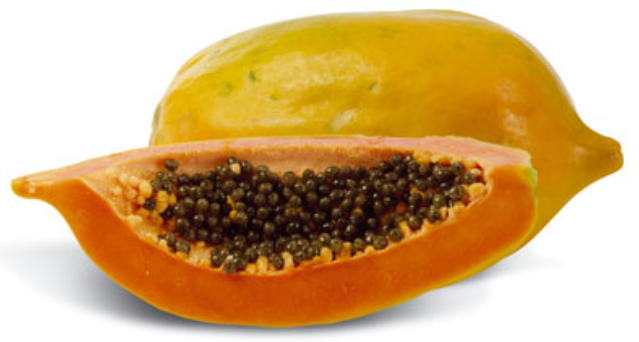 Organo-sulphur compounds called isothiocyanates are found in papaya. In animal experiments, isothiocyanates protected against cancers of the breast, lung, colon, pancreas, prostate, as well as leukaemia, and they have the potential to prevent cancer in humans. Isothiocyanates have shown themselves capable of inhibiting both the formation and development of cancer cells through multiple pathways and mechanisms. (International Journal of Oncology, October, 2008). Types of isothiocyate in fruit and vegetable. Researchers in Japan - clarified the mechanisms of action in a type of isothiocyanates found in papaya known as BITC, which underlies the relationship between cell cycle regulation and appropriate cell death. When cancerous cells die on schedule, they are no longer a problem. The researchers established that BITC exerted cancer cell killing effects that were greater in the proliferating cells than in the quiescent cells. Cancer cells that are proliferating are much more dangerous than cancer cells that are in a state of dormancy. (Forum of Nutrition, 2009). Enzymes from papaya digest proteins including those that protect tumours. The fruit and other parts of the papaya tree, also known as the paw paw tree, contain papain and chymopapain, powerful proteolytic enzymes that facilitate chemical reactions in the body. They promote digestion by helping to break down proteins from food into amino acids that can be recombined to produce protein useable by humans. Proteolytic enzymes protect the body from inflammation and help heal burns. They do a good job of digesting unwanted scar tissue both on the skin and under its surface. Being a proteolytic enzyme, papain is able to destroy intestinal parasites, which are composed mostly of protein. To rid the body of intestinal parasites, half a cup of papaya juice can be alternated each hour for twelve consecutive hours with the same amount of cucumber or green bean juice. Research has shown that the physical and mental health of people is highly dependent on their ability to produce proteins they can use effectively. However, as people age, they produce less of the enzymes needed to effectively digest proteins from food, and free needed amino acids. They are left with excessive amounts of undigested protein, which can lead to overgrowth of unwanted bacteria in the intestinal tract, and a lack of available amino acids. Eating papaya after a meal promotes digestion, and helps prevent bloating, gas production, and indigestion. It is quite helpful after antibiotic use to replenish friendly intestinal bacteria that were the casualties in the war against the unwanted bacteria. When the intestinal tract is well populated with friendly bacteria, the immune system is strengthened, and can protect better against flu and cancer. Papaya contains fibrin, another useful compound not readily found in the plant kingdom. Fibrin reduces the risk of blood clots and improves the quality of blood cells, optimising the ability of blood to flow through the circulatory system. Fibrin is also important in prevention strokes. Proteolytic enzymes containing fibrin are a good idea for long plane rides to minimize the potential of blood clots in the legs. People who sit at a desk all day might want to use proteolytic enzymes too. Proteolytic enzymes are able to digest and destroy the defence shields of viruses, tumours, allergens, yeasts, and various forms of fungus. Once the shield is destroyed, tumours and invading organisms are extremely vulnerable and easily taken care of by the immune system. Undigested proteins can penetrate the gut and wind up in the bloodstream where they are treated by the immune system as invaders. If too many undigested proteins are floating around, the immune system becomes overburdened and unable to attend to the other tasks it was meant to do. Proteolytic enzymes can digest these rogue proteins, freeing up the immune system. Let's ensure a slice of papaya every day in our diet. Papaya juice will be great. Have a great day.....along with a slice of papaya! I found this posting extremely interesting, Werner, and so are all the others. You convinced me to have this fruit now constantly in my kitchen. Luckily, we are Queenslanders, and have a farmer’s marked nearby where we can get them just about all year round. Your blog is a real treasure trove of valuable information and advice. Even my husband and teenage children say it makes compelling reading. Keep up the good work and thank you. I was very interested in reading your article on Paw Paws. On Lord Howe Island, where I spent my childhood, we used to grow lots of Paw Paws of course. would eat the seeds as she maintained they were good for promoting good skin. I did not like the taste of the seeds! It is a great idea of yours to dry and then grind them and use them as pepper. Paw Paws have never be on my shopping list, but after reading this posting; they will be.